Package units are an all-in-one heating and cooling system solutions, and they combine the efficiency and convenience of two different machines into one single, high-performing unit. 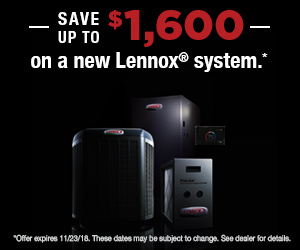 If you’re looking to have one of these hybrid systems installed, repaired, or maintained, we’re proud to be your expert, Premier Lennox dealer and installer for the Las Vegas, Lake Havasu, Kingman, Henderson, and Bullhead City areas. In our region of the country, packaged air conditioners and heat pumps comprise the majority of the systems we install. They’re generally placed on ground level outdoors, in crawl spaces, or on roofs (in cases of designs that are downflow or horizontal). These systems ensure your home’s comfort control by providing precise humidity management, top-tier performance, major energy efficiency, a high level of durability, and more. Whatever is important to you, you’ll find it already comes included in the package.